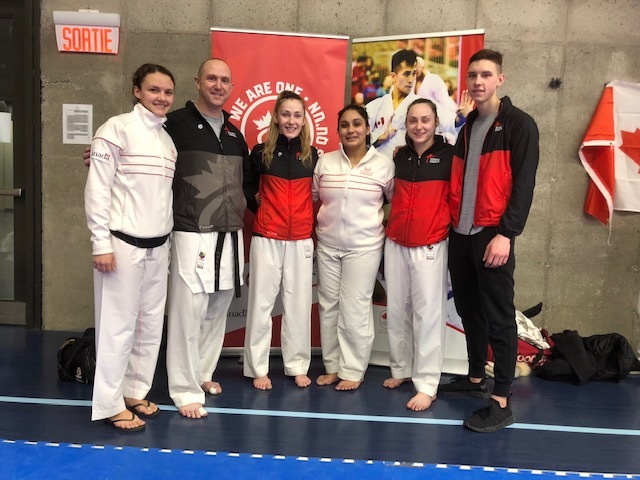 KNS – 2019 Senior Pan American Karate Championships – Atlantic Canadian Representation! Senior Team Canada – Atlantic Representation! Today we have launched the campaign #Karate2024 on social media to demonstrate our unity and to request our inclusion in the programme of the 2024 Olympic Games. Your support for the success of this campaign is crucial. For this, I kindly ask you to distribute this campaign among all your affiliates and clubs. Please, send them this information so that all the karatekas in your country can publish their videos and photos participating in the challenge #TsukiForKarate2024. In this way, we will not only showcase our unity but also how strong Karate in your country really is. I am sure that with your collaboration, we will achieve our goal of being in Paris 2024. Congrats to the Karate NS Senior team who recently competed at the 2019 Senior Nationals. Led by Coach Mitchell German, Ryan O’Neil won Silver for -67KG, while Trysten Deveau won Gold for -55KG; Roland Smith was also a member of the team who fought hard in -84KG. KNS was also represented by President Gary Walsh, and Officials David Griffin and Milton Bourque. We also want to congratulate the rest of Atlantic Canada on their medals, great showing and participation! The Athlete of the Month program is administered by Sport Nova Scotia, whose members are eligible to nominate athletes for the awards. A membership committee selects the award recipients for five possible categories: Male Individual Athlete, Female Individual Athlete, Male Team Athlete, Female Team Athlete, and Team. For more information about the awards, please visit sportnovascotia.ca. You are invited to participate in the Karate Nova Scotia Kata development training that will be taking this year and leading up to the National Championships May in Edmonton. The training will be open to all KNS members or Karate Canada Affiliates who are a minimum of 12 years of age and have achieved the rank of green belt or equivalent. All the training sessions will be held at the Windsor Karate Club at 4404 Highway #1, Three Mile Plains, Windsor, NS. For complete details see notice. (Halifax, July 16, 2018)- Ryan O’Neil is the Cleve’s Source for Sports Individual Male Athlete of the Month for June. The 21-year-old Karateka from Halifax earned his spot on the podium in two events at the 2018 Pan American Karate Federation (PKF) Senior Championships in Chile. O’Neil secured a bronze medal in the -67 Kumite and gold with his men’s Kumite team. This is the first time a Nova Scotian has made it to the podium at this competition. The international event that took place in Santiago from June 11-17 hosted 304 competitors from 20 countries. O’Neil’s success secured him a spot at the 2018 Karate world championships in Madrid, Spain from November 6-11. Nova Scotia’s sport community has much to be proud of. KNS takes pride in recognizing the achievements and the valuable contributions of so many. KNS – Presidents Close-Out to 2018 Halifax Nationals! The National Organizing Committee (NOC) for the National Karate Championships had its final follow-up meeting this week, in order to bring to a close, the Halifax, Nova Scotia Canadian Karate Championships for March 2018. As a result, it is important to recognize some of the individuals and organizations that have contributed to the success of this record breaking event. Locally – the Organizing Committee (LOC), Executive, Board, Officials, Coaches, Athletes, Medical Team, Volunteers, and Parents – as well as other related groups in the province, have been recognized for their contributions through personal thank you’s and letters recently distributed. KNS – Presidents Follow-up to 2018 Halifax Nationals! I am very proud to say that our 2018 National Karate Championships in Halifax was a huge success. I have also had the opportunity to thank nearly all of the individuals – in person – for the major roles they played over the past week, month, and year(s) – in order to make this Halifax Championship a reality. I will continue to do so – in order to let you know how special and important you are to KNS, and in particular your role at the National Championships. KNS – Hauls in Hardware at the Nationals Awards Banquet! Congrats to all the winners at the 2018 Karate Canada Awards Banquet, especially Nova Scotia’s! KNS – Host Team NS Earns Some Gold from Nationals! Congratulations to Team Nova Scotia on their performance at the 2018 Karate Canada National Championships held this past weekend in Halifax! Lead by the spectacular unprecedented performance for a Nova Scotian Athlete – Trysten Deveau – Gold U21 -55kg, Gold Senior -55kg, Gold as member of Senior Women’s Kumite Team Atlantic! Senior Men’s Kumite Team Atlantic NS members Tyler Deveau, Ryan O’Neil, Sean O’Neil and Roland Smith were part of a spectacular and action packed victory against Team Quebec and the hard fought battle against Team Ontario. First year on the team pleasant surprises! Congrats to all Team KNS Athletes, Coaches, Referees and Local Organization Committee and its army of volunteers! You need a village to raise a Championship! All kinds of great photos on the Karate NS Facebook page! Nova Scotians heading to Halifax for Karate Canada Nationals March 9 to 11th in Halifax! Hear Us ROAR! Come, watch & support Team Nova Scotia as they compete at the Karate Canada National Championships, Canada Games Centre Halifax, March 9 – 11th! Introducing the 2018 KNS Team, 33 Athletes, 6 Coaches and 9 Officials. Nova Scotia is hosting Karate Canada Nationals March 9 – 11 in Halifax! On behalf of the KNS Executive, our Board of Directors, and the membership throughout Nova Scotia, it is our pleasure to inform everyone that we are hosting National Championships from March 7th to 11th, 2018 – at Halifax’s Canada Games Centre. Thanks to a great deal of work by KNS, Karate Canada has offered us the opportunity to host the 2018 National Karate Championships, right here in Halifax. It has been over a decade since “Team Nova Scotia” has had the opportunity to perform before its home town crowd. To host an event of this magnitude will certainly raise the excitement and interest in our sport throughout all of Atlantic Canada. With the total support of New Brunswick, Prince Edward Island, and Newfoundland – all four provinces are looking forward to the rewards that come with hosting the National Championships on the East Coast of Canada. Nova Scotians headed to Junior World Karate Championships in Spain! It is a great accomplishment to have 3 Nova Scotians on the team! Sensei Dave Griffin will also be there as an Official. Great representation from Nova Scotia! Ryan O’Neil of Halifax has been named the Cleve’s Source for Sports Male Individual Athlete of the Month. O’Neil, 20, won a gold medal in the U21 -67kg division at the 2017 Junior Pan American Karate Championships in Argentina. As a result of this placing, O’Neil was recently named to Team Canada for the Jr. World Karate Championships which are being held next month in Spain. The Canadian Sport Centre Atlantic’s fall Podium Performance Series as well as the new Coach Webinar Series, are now open for registration! Registration for all of these events is done through the CAC Locker at www.coach.ca. Login to your account and go to Calendar > Nova Scotia and then click register on the event. These free professional development opportunities give CAC PD points for your coach maintenance of certification requirements. All Podium Performance Series events are held in person from 7:00 – 8:30 PM at the Canada Games Centre in Halifax. These are open to any coach and are targeted toward performance team, University, Canada Games and Provincial level coaches. The new Webinar Series events are held online from 9:00 – 10:00 PM. These are open to all coaches, at all levels. You will have the opportunity to speak and interact with the presenters if you attend live and they will be recorded and posted if you are unable to attend the live session. Ryan O’Neil medals at U21 Pan American Karate Championships! Congrats to Team Canada’s success so far in Argentina! Especially Nova Scotia’s own Ryan O’Neil. Bronze medalist. Won 8-0 against Peru first match, won second match 7-0 against Colombia, won third match 6-0 against Brazil, he lost 4th match 2-0 and won bronze medal against Guatemala 8-0! Nova Scotians headed to U21 Karate Championships and headed to Junior Pan American Karate Championships! New Glasgow teen headed to Junior Pan American Karate Championships! New Glasgow – Anyone who watched the Canada Day Parade in Westville probably saw Maddox Fields. A member of the New Glasgow Karate Club, he and his father demonstrated kumite (freestyle martial arts fighting) along the parade route. People will want to keep on watching the 13-year-old as he enters the world of international competition this summer. In August, he will travel to Argentina to compete in the Junior Pan American Karate Championships. Amazing promotional opportunity with local, national and inter-national potential. On March 9, 10 and 11, 2018 Karate Nova Scotia will be hosting the 2018 Canadian Karate Championships at the Canada Games Centre in Halifax, Nova Scotia. The event will feature about 400 athletes from across Canada, as well as hundreds of Coaches, Officials, parents and other support staff. The event is live streamed and is seen by many people across Canada and around the world. Download the information package which details the various levels of sponsorship opportunities. If you are interested in a sponsorship package or would like to discus this further, please contact Dave Griffin (d19560809@eastlink.ca). Karate Canada Junior National Team! Congratulations to KNS Team Member Maddox Fields for being named to the Karate Canada Junior National Team, and will represent Canada at the Jr. Pan American Championships in Argentina in August. If you would like to support him, check out his make a champ fund http://makeachamp.com/maddoxfields! June 3rd saw the Mukashi Karate Club host the Annual KNS Awards banquet. Sensei Bourque and his team put on a great show! Dwayne Robicheau was the “Host with the Most”. Lots of words of encouragement and recognition were shared with the sold out crowd of 70+. This event also saw an addition to KNS Hall of Fame in the form of Sensei Michael S. Delaney. The Yarmouth Karate Challenge Cup was a success once again. We ended up with 138 competitors. Two from NB and Two from St. Pierre Miquelon. Windsor won the cup with 110 points over Ryuseikan. We had a late start due to an accident on Hwy 103 and did not get underway until 10 am or so. However with three plus rings and 19 officials we were all wrapped up with the mats loaded on the truck by 4:45. I thought that was awesome. we shut things down between 12:20 and 1 pm for the demos. Only two this year but again lots of good feedback. The King of the Ring was a success. We had 11 boys and ran 30 matches in 15 minutes. It wasn`t as exciting in the girls with only 4 competitors. Prior to the competition we had a minute of silence for 2 gentlemen who had an impact on the local karate community: Mr Victor Swinimer, and Ryan Jimmo. Windsor Karate Club – CUP! Karate NS will pay the cost for two members of each registered dojo to attend. Any other person who would like to attend is welcome but they will be required to pay their cost for the course. The cost is due on the course date. If you are not selected to attend but wish to attend, please speak with your Chief Instructor and they will pass your name along with the two designated club members. See notice for all the details! Deadline to confirm June 6th! Ryan O’Neil from NS will be part of Team Canada competing at the Senior Pan Ams. In total, 27 athletes will be competing in Curacao (Dutch Caribbean) on May 25-27. This year for the first time, the Sr Pan Ams will include Para-karate divisions and Canada will be well represented with 3 athletes. The Yarmouth Challenge Cup is shaping up to be an action packed weekend, June 2th-4th! Thanks for your time and please share with your fellow karateka, family, friends and fans! Which DOJO will be crowned CHAMPIONS!! Brooklyn Rutherford thought it was the breakthrough of a lifetime. Brooklyn Rutherford thought it was the breakthrough of a lifetime. The 18-year-old karateka had just snatched gold at the Canadian National Karate Championships — her first in five years’ worth of competitions — and in the process had unraveled an old foe who was previously unflappable. The moment was hers to cherish until, moments later, it wasn’t. Brooklynn Rutherford hated fighting, but ended up in karate anyway. Now the Grade 12 student from Brookfield is a national bronze medalist. GREENWICH NS – Eleven-year-old Kailyn Beaton was beaming on April 8. And no wonder – the Windsor karate athlete won a gold medal in age 10/11 advanced kata at the third Grand Prix tournament of the season. Kailyn was one of 160 competitors who turned out to spar in three rings simultaneously at Horton High School. Windsor coach Theresa Griffin said there were athletes taking part from age five right up to those in their 50s on Saturday. Dojos from Yarmouth to New Glasgow were represented. KNS – 2018 Team Tryouts and Training Camps! Nationals will be held in Halifax, March 8-11, 2018. Athletes need to be 12 years by March 9, 2018 in order to compete at Nationals. The Karate Nova Scotia website has a team page that will also have information as the season moves one. Please visit regularly. Please make every effort to bring your completed Athlete Information Form with you! Anyone who has questions about the team workouts please contact Karen Armour at Karen.armour@ns.sympatico.ca. KC – New Certified Master Coach Developer! Gary Walsh has completed all the requirements to become a Certified Master Coach Developer. Gary is the first to attain this level of competence in Karate Canada. His knowledge, motivation, enthusiasm and perseverance make him an ideal model for others and a great asset to Karate Canada’s NCCP program. He will certainly contribute to elevating the quality of coaches and pave the way for others, in the Maritimes and in the rest of Canada. HALIFAX, NS (March 23, 2017) – February’s Cleve’s Source for Sports Female Individual Athlete of the Month honours have been awarded to Brooklyn Rutherford of Brookfield. Competing in the kumite Individual Female U21 +68kg and the kumite Individual Female Senior +68kg divisions, the 18 year-old won two bronze medals at the Canadian National Karate Championships in Quebec. KNS – 2017 Provincial Team Success at Nationals! 2017 Nationals are over, here is the summary of our success! Congrats to everyone! KNS – 2017 Provincial Team Heading to Nationals, Feb 22nd to 26th! Also attending are 4 coaches: Mitchell German, Greg Da Ros, San Fung German, and Karen Armour. We have 3 officials attending: David Griffin, Milton Bourque, and Garrett Chase. In case you have not heard, Halifax will be the host city for the 2018 Karate Nationals! We would like to introduce the Lead Team Members for the National Championships, to be held in Halifax on March 9th to 11th of 2018. The team held their first meeting Saturday 5 Feb 2017 at King’s-Edgehill School in Windsor, N.S. Lead Team Members in the photo from L to R are: Patrick Thompson, Gary Walsh, Cary Hollett, Craig Sexton, Chris Richards, Garrett Chase, and Dave Griffin. Missing from the photo are Cherry and Rick Whitaker. The next meeting will be after the Quebec City Nationals. The IOC Executive Board has agreed to include Karate in the Youth Olympic Games 2018, which will be held in the city of Buenos Aires, Argentina. This is a new milestone to be added to the already decisive decision of including our sport in the 2020 Tokyo Olympic Games. Winter 2018!!! We are looking for 15 plus Volunteers to work the tables as Minor Officials!! Are you that one of 15 persons we need? What do you do when you are a two-time world champion in taekwondo? For Halifax’s Ryan O’Neil, you switch your focus to karate. The Karate Community recently lost a dear friend – with the passing of Victor Swinimer. Victor was known by all, and greatly respected throughout the Province, the Atlantic Region, and Nationally – as a Sensei, a Coach, a Regional Director, an Official, a Father, and a true friend. Here is the obituary for Sensei Victor L Swinimer. I imagine there will be a big group to celebrate the life of Victor on Nov 19th.